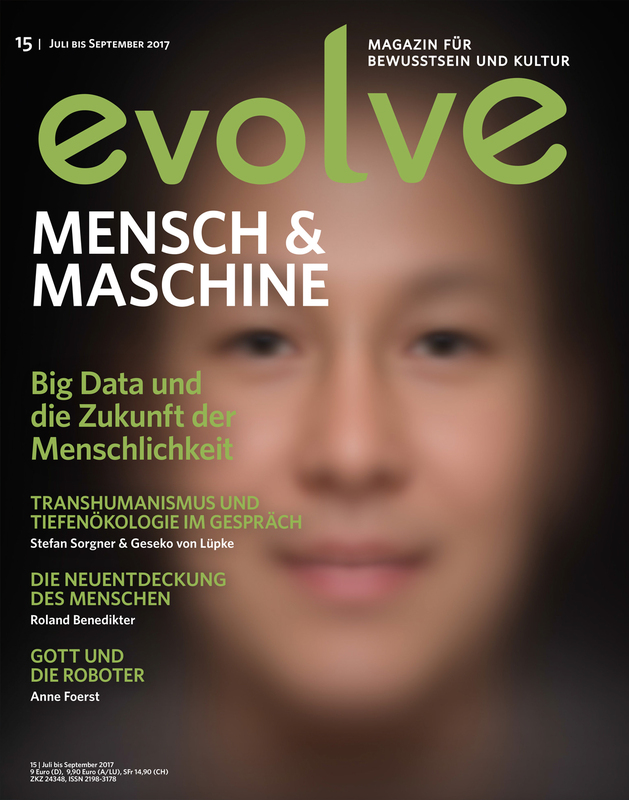 in der evolve 15 – „Mensch und Maschine“ wird mehrmals die Aussage gemacht, dass Yuval Harari in seinen Büchern, vor allem in seinem letzten Buch „Homo Deus“, alle Lebewesen und somit auch den Menschen als „eine Art Algorithmus“ bezeichnet. So wird dargestellt, dass diese Bezeichnung „für ihn“ [d. h. für Yuval Harari an sich als Autor und Mensch] „die logische Schlussfolgerung aus den Erkenntnissen der modernen Naturwissenschaft“ wäre (siehe Thomas Steininger in „Die Algorithmen und wir“) bzw. berichtet, dass Harari aussagt, dass „eigentlich jeder Organismus ein Algorithmus ist“ (siehe Interview mit Roland Benedikter in „Die Neuentdeckung des Menschen“). Ich gebe zu, die Art und Weise wie Yuval Harari seine Bücher geschrieben hat, lässt dem Leser viel Raum für Interpretationen und, meinem Empfinden nach, ist das auch von Anfang an die Absicht des Autors gewesen. Nach dem sehr aufmerksamen Lesen, kann ich nicht behaupten mit Sicherheit erkannt zu haben, welche tatsächliche persönliche Aussage Yuval Harari macht und ob er überhaupt eine eindeutige Stellung bezieht. Vielleicht ist das so, weil Harari, als Kind des marktwirtschaftlichen Kapitalismus, auch er von seinem Umfeld vorprogrammiert, einfach Bücher schreiben möchte, die sich überall sehr gut verkaufen? Oder als Welt-Historiker und Wissenschaftler einfach mal zwei Bestseller veröffentlichen wollte, die keine Aussagen beinhalten, die von dem wissenschaftlichen „Establishment“ attackiert werden können? Oder vielleicht ist er einfach nur ein genialer Autor, der tiefgründigen Aussagen so zu gestalten vermag, dass sie zu einem Bestseller werden und dadurch doch die ganze Welt erreichen und zum Nachdenken verleiten? Science is converging on an all-encompassing dogma, which says that organisms are algorithms and life is data processing. Are organisms really just algorithms, and is life really just data processing? Ich habe den Text mit Absicht nicht übersetzt – das kann jede/r selbst für sich übernehmen. Ich persönlich lese hier, dass Harari seine Leser gerade zu aufdringlich davor warnt, dem aktuellen wissenschaftlichen Trend – lebende Wesen als Algorithmen zu betrachten – blind zu vertrauen und sie anschließend sehr klar zum Nachdenken auffordert. Jede/r sollte versuchen, sich selbst die drei (für die Menschheit als Spezies) wichtigen Fragen zu beantworten. Vielleicht wäre es sehr hilfreich, vor allem für die Leser, die Harari nicht selbst gelesen haben, diesen Aspekt in Bezug auf seine Aussagen klarzustellen? Thank you very much for your concern and question about Harari’s position as to whether we humans are algorithms or not. I would argue that the point that humans, and all biological organisms, are algorithms is central to Harari’s thesis: “Humans are algorithms…” (p. 98), “What we call sensations and emotions are in fact algorithms” (p. 100), “We are ruled by emotions [that are]…in fact sophisticated algorithms” (p. 163-164), “Organisms are algorithms…including Homo sapiens…” (p. 372), “Organisms are algorithms…. [H]umans are an assemblage of many different algorithms lacking a single inner voice or a single self” (p. 383). His point that we are algorithms is intended to knock human beings off our perch as a creature superior to all the rest. The fact that human beings are algorithms cobbled together by evolution is key to his argument that we have no free will, we have no self, better algorithms from AI may replace our hegemony, and in the process, the Western ideals of humanism and the Enlightenment will become as obsolete as belief in the Greek gods. What will replace it, he argues, is “Dataism,” the algorithmic knowledge of Big Data that will know us better than we do. Humans will have value to the extent that we are data producers and users, not because we are more intelligent or conscious than other forms of life or AI. Yes, five pages before the end of the book, and again in the third from the last sentence, Harari asks, “Are we really just algorithms and is life just data processing?” After 480 pages of insisting otherwise, this is rather strange. Perhaps, rather than fearing alienating the scientific community as you suggest, he added these statements in order to give his lay readers some hope for meaning and for the value of life, consciousness, and our shared humanity. But after Harari decimates our current humanist values, the source for such hope or meaning is not clear. While we at evolve do know of Harari’s Buddhist connection (see the dedication of his book) and that materialist science and Buddhism have become strange bedfellows in our secular culture (such as many “New Atheists”), we certainly don’t know the motivation for this abrupt switch at the very end of the book. One thing seems clear, however: If Harari’s point was to argue that we are not algorithms, then he wrote the wrong book. thank you as well very much for your extensive and comprehensible answer – I must sincerely admit that, out of the adopted perspective (evolve Redaktion), your argumentation concerning Harari‘s writing reasons is flawless. However, the judgment that “if Harari’s point was to argue that we are not algorithms, then he wrote the wrong book” seems to me a little bit one-sided – that is out of my own perspective of wishing myself always David Bohm’s dialogue as a proper approach for communication. Considering Harari’s social and educational context I would say that Harari wrote exactly the book he was enabled to write (i.e. according to the achieved level of spiritual development) and addressed it correctly by using the terminology accessible to the intended audience. Just to make my intention clear: I do not intend to defend Harari’s way of writing, but just try to look at his work by using a presumably broader (and imaginative) perspective. In a world that is imposed by “the Western ideals of humanism and the Enlightenment”, in which the power of the human brain is considered to be the measure of all things and the rise of the “Understanding of the World” promises the ultimate heal of all “human limitations”, is Harari , i.e. in my perception, just a representative of an unconscious majority – an individual who _feels_ the drive that not all what is said and propagated within the present human society seems to be “right”, i.e. inclusively the wide spread concept that humans constitute evolution’s high end and all the ignorance with respect of its negative influences on our planetary home. Though, Harari lives himself still within the world that he begins to observe and soon in the process he realizes that Understanding and Knowing about what EXISTS are obviously two very different approaches and that the human brain may in fact cope with the limited possibility of Understanding, but definitely not with the extensive multidimensional Information implied by instinctive Knowing. There, he notices, is obviously something more behind the understandable scenes of life and that “more” includes all that EXISTS in a way perceivable and comprehensive in a sense of instinctive Knowing. During the yet unconscious process of his spiritual development, Harari hears inside himself the call to _do something_ about it and he decides to write books in order to “warn” the humans about the discrepancy he himself _feels_ in within. He does this despite the fact that his own wish to “understand” the discrepancy he _feels_ still predominates the allowed instinctive Knowing regarding the Sense of that call. Harari intends to reach a very great audience, so he uses for writing a journalistic style that copes with the understanding ability of most existing humans and consequently lists in his books all the “very truths” being already “evidenced by science” and “the technological progress” that he can find. Hence Harari’s text reads like he himself would actually personally agree with the statements he just lists. Nevertheless, at the end of his work Harari asks viable questions about the core statements and encourages the reader in observing his own concepts considering the “truths” listed. Harari’s approach is allowedly quite strange, but it is still comprehensible and by using it Harari really accomplishes the task to reach a really great number of humans all over the world, first of all many of the ones which, for a fact, probably would not even think about reading a magazine having a background as evolve has – i.e. indifferent of their real reasons not to do it. What I intensively mean is that Harari reached as well acquaintances and colleagues of mine, with whom a dialogue concerning spirituality is practically excluded, but which, after reading Harari, meant to me honestly that the vision of themselves as a selfless algorithm wouldn’t in any case match their perception and that a future dominated by cyborgs and AI data processing is for them as well not really a wishful future to cope with. More, they meant that Harari’s books are worth to be recommended as set books in schools – a statement with great impact on future generations if ever implemented. Seen from this enhanced perspective Harari is himself a “change worker”, indeed on a level previous to a declared conscious spiritual development and, according to this level and thanks to the used terminology and writing style, his work seems to attain the desired worldwide attention. On the long run I would not be surprised if Harari would turn out to be even an enabler for future evolve readers. Of course this is an imagined and my personally perceived view of Harari’s motivation for writing his books. Nonetheless is it a possible and an inclusive one within the meaning of an open dialogue able to promote the societal change we all feel to become more and more necessary. Thank you for reading all of this despite my uneducated English :-). ich habe mit Neugierde die neueste Ausgabe von evolve erwartet. Jetzt halte ich sie in der Hand und kann die Vorgehensweise im Fall meines Leserbriefes zu Yuval Harari nicht wirklich nachvollziehen. Ich habe den offenen Dialog gesucht und, nach der ersten Antwort der evolve-Redaktion (Elizabeth Debold), der auch zeitnah meine Rückmeldung folgte (bitte unten im Mailverlauf sehen), dachte ich diesen offenen Dialog auch gefunden zu haben und hatte mich sehr gefreut. Ich hatte auf eine weitere, ko-kreative Antwort erhofft, jedoch nicht unbedingt auf eine entsprechend ausführliche Behandlung im Inhalt der Leserbriefbereiches. Stattdessen finde ich meinen Leserbrief nur unvollständig wiedergegeben und dazu, aus einem noch offenen Dialog, nur die erste Antwort, die sich für mich wie das Postulieren einer sich über allen Zweifeln befindenden „Wahrheit“ lesen lässt. Korrekt wäre es, meiner Ansicht nach, den englischen Anteil des Textes meines Leserbriefes unverändert zu lassen und die Übersetzung anschließend und entsprechend markiert hinzufügen, sodass jede/r LeserIn auch den Ton des Originaltextes selbst vernehmen und sich eine eigene Ansicht bilden kann. Auch erwartete ich nicht, dass zu meinem Leserbrief auch eine Antwort angedruckt wird, sondern dass meine Ansicht einfach in dem dialogischen Raum bestehen gelassen wird – eine Ansicht unter anderen, die möglich sind. Und, wenn doch eine Antwort dazu gehören muss (warum eigentlich? ), dann, dass auch meine Antwort zur Antwort der evolve-Redaktion wiedergegeben wird, eventuell mit weiteren Kommentare der evolve-Redaktion – hier wäre ich, da mein Englisch in der Tat nicht so gut ist, für eine sinnvolle Übersetzung meiner Ansichten ins Deutsche, sogar dankbar gewesen. So hätte auch das schöne Bild eines offenen Dialog an Konturen gewonnen und seine Wirkung öffentlich kundgetan. Dass es so nicht passiert ist verwundert mich, macht es mich sehr traurig und motiviert mich nicht wirklich dazu, wieder mit dem evolve-Team einen Dialog auszusuchen. Ich zweifele im Moment daran, ob das evolve-Team an einen offenen Dialog mit den Lesern und Leserinnen wirklich Interesse hat und nicht nur darauf bedacht ist, die „eigene Wahrheit“ zu verbreiten … Daran hätte ich nämlich keine Interesse, denn das hat niemals zur spirituellen Weiterentwicklung irgendeines Wesens beigetragen. Ich hoffe ehrlich, dass _ich_ hier im Irrtum bin. I am very sorry to take so long to respond to your last letter. I apologize. As a team, we decided that it would be best for me to continue the correspondence with you, and my attention has been on our global event, One World Bearing Witness, so I was negligent and did not turn my attention to our magazine and your letter until last week. I have to read your letter to us in translation, because my German is very very poor. (Unlike your English, which is fantastic, really.) You are upset or disappointed (sad) because you feel that your intent and letter were not portrayed accurately in their fullness in the magazine. That may be so. We do not have the space to include every letter from our readers in full in the magazine. It is common practice in the “letters to the editor” section of magazines for the editors to edit the letters. Your letter was particularly long, so we took what was the most central criticism and published that. And, because it was a question upon which the Mensch & Machine issue was grounded, we felt that our other readers needed to have our response. Your idea to publish the back-and-forth between us in the magazine is, unfortunately, not feasible–again, it is an issue of length. We could, however, publish them on our website’s blog, if that is something that you feel would be more fair to you. In terms of your last message to me, the one that continued our conversation, your imagined view on Harari’s motivations and the limitations that he was working with are very interesting and might even be true. I, however, cannot have a Bohmian dialogue with Harari because I am not present with him, sharing in a conversation in a formal process, which is the only context for such a dialogue as far as I understand it. For me, as part of evolve, when I speak of “Harari,” I am referring to the ideas expressed in the book that Harari authored and the assumptions that they are logically based on. That is all I have as “evidence”–which includes, for example, his dedication to his meditation teacher, Goenka. I can speculatively put Harari in the company of others who are blending Buddhism and materialism (the philosophical perspective; not the attitude of consumerism), but that is just for painting a larger cultural context. Anything further–imagining his motivations, spiritual development, limitations on his true hopes or wishes–just isn’t appropriate for the magazine, unless I would declare it as a fantasy of my own making. You may be right in wondering if Harari actually holds the perspective that he presents–it’s actually difficult for me to consider that people find a future world run by AI to be something positive. He does a brilliant job asserting the view of science, and he insists that this move to a world where humans are like pets to the machines that run everything is actually what is happening now, and he doesn’t criticize it, instead he presents this as inevitable. Perhaps the effect might be as you suggest: that after people read the book, there will be more resistance to this “take over.” To me, that would be positive. But as much as I might wish for this, I cannot claim that Harari, as the author of the book that says these things, also is looking for this outcome. That I don’t know, and therefore, I take him at his word–as expressed in the words of his book. I hope that you will accept my apology for the lateness of my response. And please let me know if you would like this chain of correspondence to be put on our website. thank you very much for your answer! Even if it comes, as you say, a little bit late, you can be sure that I correctly comprehend and fully accept the reasons that led to this situation and also why our conversation-text couldn’t be published in whole length in the magazine itself. I can also follow your argumentation regarding Harari and I would say that, for our conversation, your words constitute a proper final consideration out of evolve point of view. We have two perceptions of a book and it’s author that freely complement one another. This encourages me in further commenting evolve-contents as well, as I did in the past, still in hope of a coherent dialogue with the evolve-team – which is my main intention for doing it, i.e. I don’t mean to criticize, but merely to add a new point of view – my point of view – to the already depicted ones and thus enlarge the shared vision of the theme as during a dialogue. To say it with Maturana (approximate quotation from a video of him): I can say only what I _think_ to be the truth at the moment I’m saying it, being also aware, that the fact that I’m saying it, already changes the context of what I’m saying, while I’m saying it. In the sense of a shared work for a better world, to which each of us contributes the way accessible within our personal context, I would say that our conversation would find a very good place to be published on evolve‘s blog on the website. Nevertheless, for me this is not a matter of evolve being fair to _me_, but of evolve being fair to its own claim of enabling a “world in dialogue”. And _I am_ a part of this dialogue, even if only in the way accessible to me. Thank you very much for offering me this chance. I wish you (and evolve-team) also a wonderful holiday.